Admissions Open at Quaid i Azam University's Main Campus, Islamabad for the batch Fall 2018. QAU offers admissions in different fields of study for Bachelor and Master Programs. 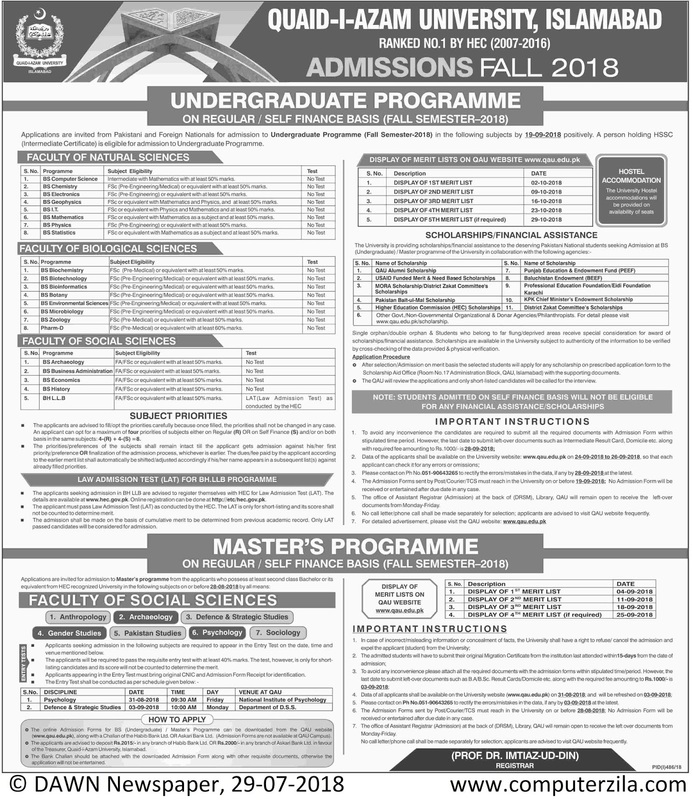 Quaid-i-Azam University offers admissions in Bachelors and Masters subjects separately in faculties of Natural Sciences, Biological Sciences and Social Sciences. Scholarships and Financial assistance is also available for Students. University DescriptionThe Quaid-i-Azam University (QAU) is a public research university in Islamabad, Pakistan. Founded as the University of Islamabad in 1967, it was initially dedicated to the study of postgraduate education but expanded through the 1980s to an interdisciplinarity university offering under- and post-graduate education. The university has, as of 2015, grown into the largest varsity in Islamabad with a total enrollment exceeding 13,000 students. The university is on a 1700 acres campus on the foothills of the Margalla. Campus AdressQuaid-i-Azam University Islamabad, 45320, Pakistan.